This year, Anida van der Spuy, who has been a KAMERS deli supplier from the beginning, is our KAMERS 2013 Stellenbosch Deli Coordinator. Anida has selected a delicious mix of the best of the best gourmet food traders for our deli, to ensure that there is something for everyone. She introduced us to Chef and Free Food Activist, Wynand van Rooyen, whose pop up eatery is far and away the most exciting new addition to the KAMERS deli. 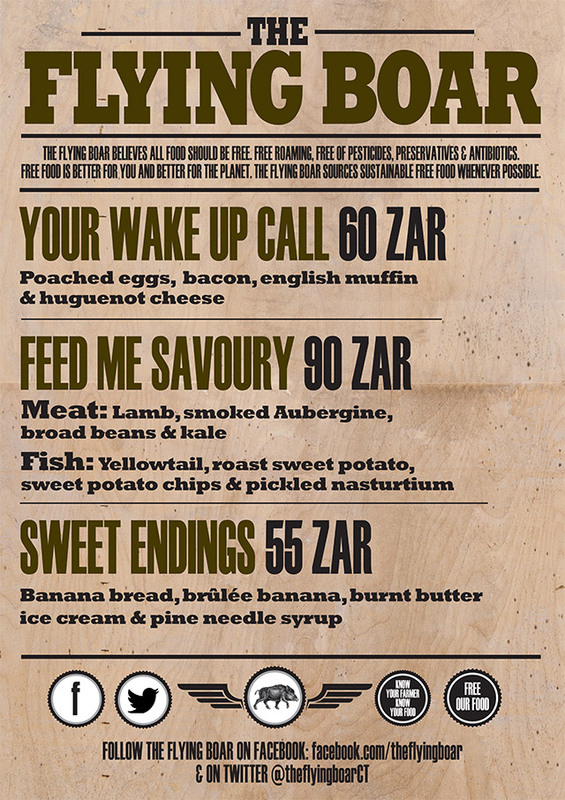 The Flying Boar promises to raise the bar of your KAMERS food experience. Wynand’s love and passion for food started at a young age. He was always involved in the kitchen. As a baby he would empty drawers and climb them, just to be able to sit and watch his mom and dad cook. Growing up he also helped slaughter grass-fed cattle and sheep every year at his Grandpa’s farms on both sides of the family! “I just started mincing meat and as we grew older I was upgraded to cutting up the carcasses with my dad and the rest of the family!” This early interaction with food and its origins has had a profound effect on how Wynand now cooks and sources his food. 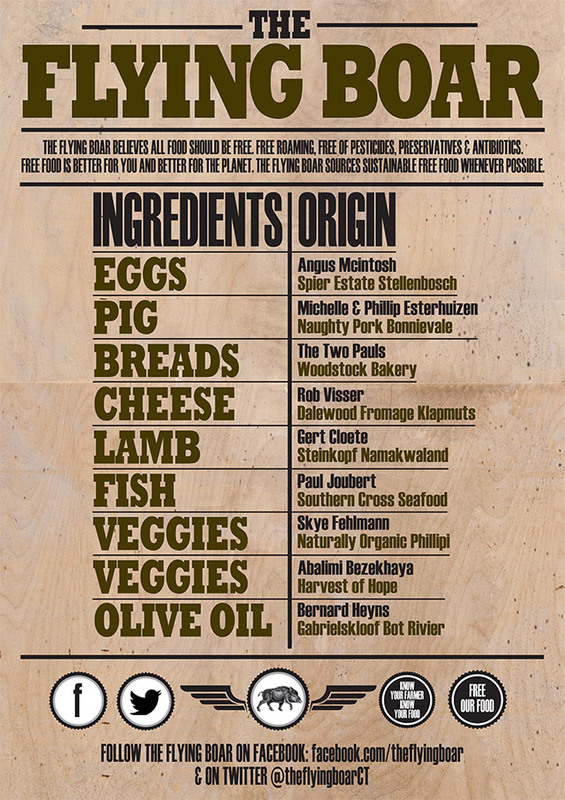 Wynand is a passionate believer that we are what we eat and that we need to know the origin of all our food. He says that the connection with the farmer is critical, not only for creating award-winning dishes, but more importantly for protecting a wholesome and sustainable food system. Wynand has won a number of prestigious awards. In October 2011 Wynand became the youngest chef ever to win the coveted title of Sunday Times Chef of the Year 2011 with his flavour-packed Jerusalem artichokes and beetroot glazed springbok loin. Earlier in 2011 Wynand took the title of Jeunes Chefs Rôtisseur (Young Chef of the Year) at the South African finals of the Chaîne des Rôtisseurs Concours National des Jeunes Chefs Rôtisseurs 2011. 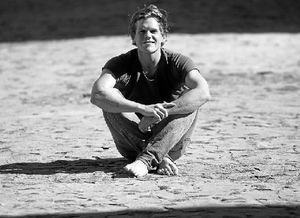 Wynand then represented South Africa at the international final in Istanbul, Turkey on 9 September 2011 and came an impressive fifth out of 25 entrants. Wynand started his career at the Saxon hotel in Johannesburg. He worked in Stellenbosch at Nice restaurant and the last three years he was Planet Restaurant’s Chef de Partie at the Mount Nelson hotel in Cape Town. Wynand’s whole idea behind The Flying Boar, his pop up eatery at KAMERS, is to take food back to a time when we knew our farmers and used produce that was as pure and natural in origin as possible. By doing this he hopes to educate people and get them to start questioning what they are eating and where it comes from. 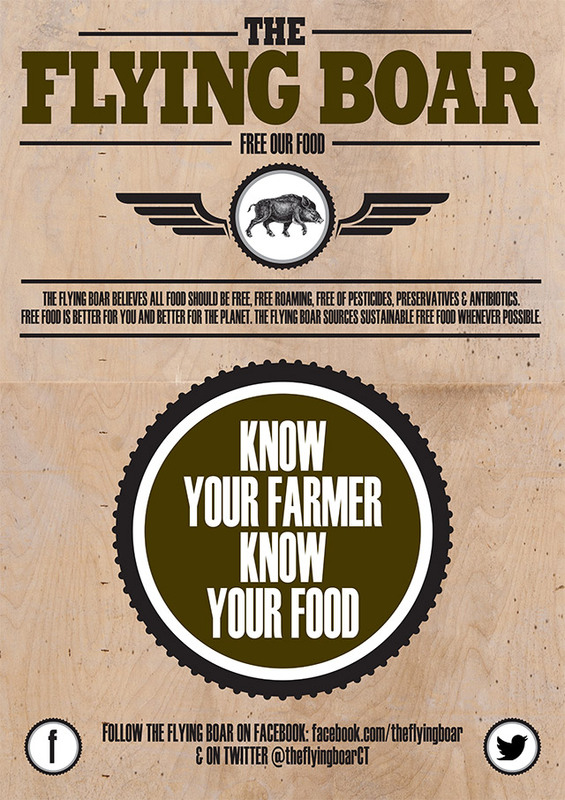 The Flying Boar believes all food should be “free.” Free roaming, free of pesticides, preservatives and antibiotics. “Free food” is better for you and better for the planet. The Flying Boar sources sustainable, “free food” whenever possible. The mouth watering menu at The Flying Boar reflect Wynand’s “free food” beliefs in that all the ingredients are traceable to source. Follow The Flying Boar on Facebook where Wynand will be sharing the story of the origin of his ingredients, as well as their preparation processes. The Flying Boar will be operating from 5-10 November at KAMERS 2013 Stellenbosch, at Weberburg Estate. To book your table at his culinary experience, please email bookings.theflyingboar@gmail.com. Please specify date, time (12:00 – 15:00 or 15:00 – 18:00), number of people and contact number. Smoking aubergines, peeling broad beans and lamb, ready for The Flying Boar‘s meat dish. Wynand separating free roaming egg yolks, adding organic sugar and vanilla to the milk and straining burnt butter to create the delicious burnt butter ice cream in the mixer on the right. 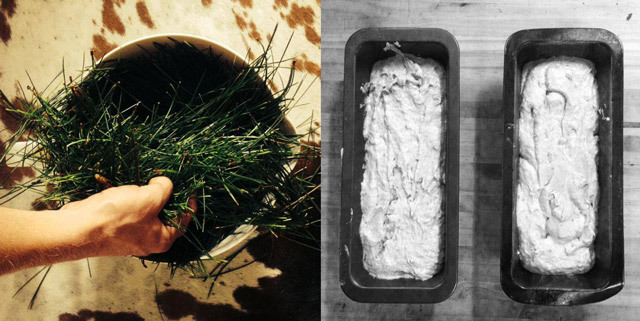 Collecting pine needles and baking banana bread as part of The Flying Boar‘s Sweet Endings desert, which includes the burnt butter ice cream, brûlée banana and pine needle syrup. Tags: Anida van der Spuy, chef, deli, Food, free range, ice cream, KAMERS 2013, meat, organic, Stellenbosch, The Flying Boar, Wynand van Rooyen. Bookmark the permalink.